A large enough sail would provide thrust from the pressure of sunlight, with no need for fuel. Light exerts pressure on objects on which it shines. If collected on a large enough surface, the pressure of light can be used for space propulsion. 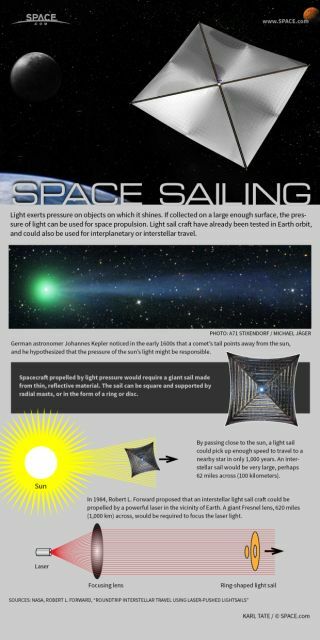 Light sail craft have already been tested in Earth orbit and could also be used for interplanetary or interstellar travel. German astronomer Johannes Kepler noticed in the early 1600s that a comet’s tail points away from the sun, and he hypothesized that the pressure of the sun’s light might be responsible. Spacecraft propelled by light pressure would require a giant sail made from thin, reflective material. The sail can be square and supported by radial masts, or in the form of a ring or disc. By passing close to the sun, a light sail could pick up enough speed to travel to a nearby star in only 1,000 years. An interstellar sail would be very large, perhaps 62 miles (100 kilometers) or more across. In 1984, Robert L. Forward proposed that an interstellar light sail craft could be propelled by a powerful laser in the vicinity of Earth. A giant Fresnel lens, 620 miles (1,000 km) across, would be required to focus the laser light.